Background: Liquid-based cytology (LBC) has been developed as an alternative for conventional cytology (CC) in cervical smears. It is now increasingly being used all over the world for cervical cancer screening. However, its role and diagnostic accuracy in bronchial wash (BW)/bronchoalveolar lavage (BAL) specimens remains undetermined. Aims: To assess and compare the diagnostic performance and accuracy of LBC with CC for detecting malignancy in bronchial specimens. Settings and Design: This was a retrospective analytical hospital-based study. Materials and Methods: Bronchial specimens (BW/BAL) received over a period of 4.5 years were reviewed. The samples were processed by CC from June 2010 to September 2012 (2.25 years) and by LBC from October 2012 to December 2014 (2.25 years). Data were retrieved from the records of cytology laboratory and compared among both the groups. Detection rate for histologically or cytologically verified samples was calculated. Results: A total of 559 cases verified by histological and cytological follow-up were evaluated. These included 247 CC cases and 312 LBC cases. The positive diagnostic rate for malignancy in CC was 28.6% whereas that for LBC was 32.9%. The negative diagnostic rates were 66.5% and 66.3% for CC and LBC, respectively. However, unsatisfactory rates had shown a good reduction from 4.4% in CC to 0.6% after LBC introduction. The smears showed more homogeneous distribution of cells with elimination of obscuring factors such as blood, inflammation, and mucus. Conclusions: The diagnostic accuracy of LBC was slightly better than CC. The unsatisfactory rates showed reduction in LBC preparation. Thus, LBC is a viable alternative to CC and has the advantages of standardization of preparation with decrease in unsatisfactory rates. 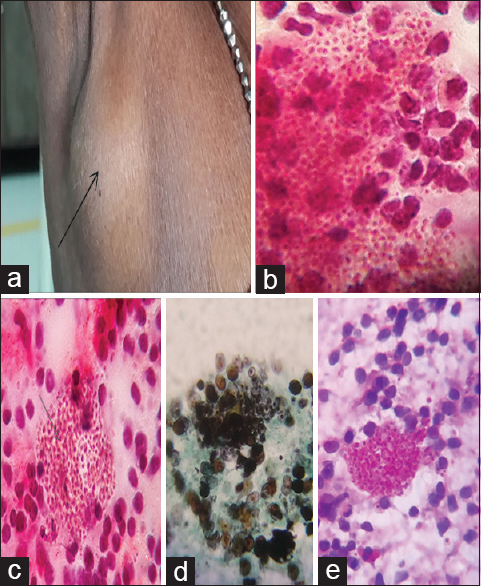 Context: Fine needle aspiration cytology (FNAC) of superficial or deep-seated lesion is an increasingly common practice, eliminating time consuming and costly diagnostic procedures and providing rapid and safe diagnosis. Aims: To assess utility of cell block preparation method in increasing sensitivity of cytodiagnosis in deep-seated image-guided FNACs. Settings and Design: This was a hospital-based observational study conducted in the Department of Pathology, over a period of one and a half years. Materials and Methods: A total of 46 cases of abdomino-pelvic and intrathoracic masses subjected to guided FNACs were included. Along with conventional smears, cell blocks were prepared by using AAF (95% Ethanol 34 ml + formalin 4 ml + Glacial acetic acid 2 ml) as fixative agent. Statistical Analysis Used: Done using MedCalc Version 12.7.5.0 to find out the sensitivity, specificity, and diagnostic accuracy of conventional smears and cell blocks. Results: The sensitivity, specificity, and diagnostic accuracy of cell blocks in our study was 71.11%, 100%, and 71.73%, respectively. The figures for FNA smears were 62.22%, 100%, and 63.04%, respectively. Conclusions: Cell block technique by AAF fixative is a simple, inexpensive procedure. Cell block method allows the recovery and processing of minute amounts of cellular material, facilitating better classification of tumor when reviewed along with cytological smears, the ability to obtain many sections for immunostains and other studies to be performed akin to paraffin sections produced in histopathology. Background: Tuberculous lymphadenitis is most common cause of lymphadenopathy in developing countries. 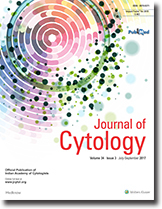 Although enormous literature is available on various aspects of the disease including cytological patterns and its incidence in others parts of India and in other countries, only limited literature is available regarding its incidence and morphological spectrum on cytology in eastern parts of Uttar Pradesh in Gorakhpur region. Aim: The present study was undertaken to estimate the incidence of tuberculous lymphadenitis in our settings along with its morphological spectrum on cytology as well as to determine the utility of culture of fine needle aspirates in addition to cytology and Ziehl–Neelsen (ZN) staining. 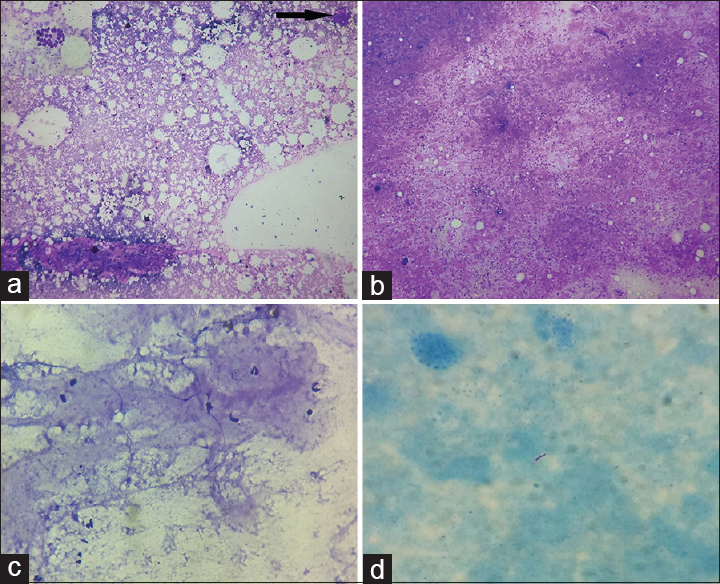 Material and Methods: Four hundred cases of superficial lymphadenopathy were subjected to fine needle aspiration cytology (FNAC), and in case, smears were stained with Hematoxylin and eosin (H and E), Giemsa, and ZN stain and categorized into three cytomorphological patterns. All the aspirates were inoculated on two sterile Lowenstein Jensen (LJ) medium. Result: Out of 400 cases of consecutive lymph nodes aspirated, 180 cases (45%) showed features of tuberculous lymphadenitis. Smears revealed epithelioid granulomas with caseous necrosis in maximum cases (40%). On statistical analysis, difference between group I and group II was found to be significant (P < 0.05); while comparison between groups II and III as well as between groups I and III was found to be statistically insignificant. Overall, acid fast bacilli positivity was seen in 51.6% of the cases. Conclusion: FNAC has been proved very safe, highly sensitive, and first line investigation in diagnosing tubercular lymphadenitis. The sensitivity can be further be increased by complementary cytomorphology with acid fast staining. Diagnostic accuracy can further be increased by culture. 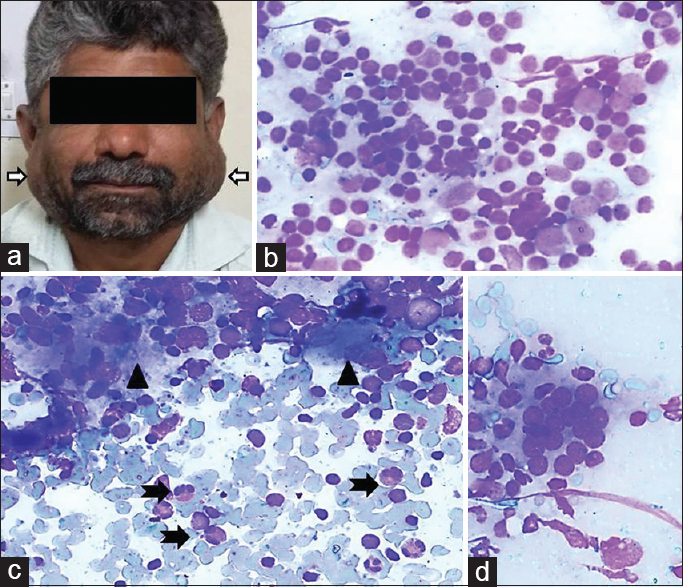 Introduction: Atypia of undetermined significance (AUS) or follicular lesion of undetermined significance (FLUS) of Bethesda system for reporting thyroid cytopathology has emerged as most controversial category due to its heterogeneity and inconsistent usage. Initially associated risk of malignancy was estimated to be about 5–15%, but eventually different results have been obtained across institutions due to variable follow-ups and interpretation. The present study was conducted to evaluate the rate of malignancy along with appropriate management in this category. Materials and Methods: The study included AUS/FLUS cases diagnosed over period of 4 years on thyroid fine needle aspiration cytology (FNAC). Detailed clinical history and radiological examination were recorded along with follow-ups and management of all cases. Histopathology was available for cases which underwent surgery due to high clinical suspicion, worrisome radiological features or two consecutive AUS/FLUS reports. Results: The incidence of AUS/FLUS was 6.4% with repeat FNAC done in 39.6%, immediate surgery in 49.2% and follow-up without intervention in 11.1% cases. The overall malignancy rate was 28.5% with most common malignancy being follicular variant of papillary carcinoma (FVPC). Malignancy rate was more in cases (24.1%) which morphologically showed atypical nuclear features in comparison to architectural atypia. Conclusion: AUS/FLUS is associated with higher risk of malignancy than previously anticipated. Surgical intervention may have greater implication than repeat FNAC in appropriate management of this category. Substratification of this category according to nuclear features and architecture may be more useful in predicting malignancy risk and reducing the variability in the group. Introduction: Ultrafast Papanicolaou stain (UFP) was introduced as a hybrid of Romanowsky and Papanicolaou (PAP) stain. It enhances the quality and reduces the time. In the present study, a modified staining technique was adapted where Gill's Hematoxylin was replaced by Harris Hematoxylin. Aims: The aim of the study was to assess the use of the modified ultrafast Papanicolaou (MUFP) stain for fine needle aspiration cytology (FNAC) of head and neck swellings in comparison with the routine PAP stain, hematoxylin and eosin (H and E), and Giemsa. Materials and Methods: Forty FNACs of head and neck swellings were collected. FNAC procedure was performed by standard method; two smears were fixed in 95% propanol and stained with PAP and H and E. Two smears were air dried, 1 was stained with Giemsa, and 1 was rehydrated with normal saline, fixed in alcoholic formalin, and stained with MUFP. Four parameters were considered and scored background, cell morphology, nuclear staining, and overall staining pattern). Results: The quality of MUFP smears were better when compared to routine PAP, H and E, and Giemsa, and was statistically significant by Wilcoxon matched pair test. Conclusions: MUFP stain in comparison to routine PAP, H and E, and Giemsa provides an excellent and suitable alterative in cytological staining for the study of various organs. Histoplasmosis is a mycotic infection caused by dimorphic fungus, Histoplasma capsulatum. The organisms are usually found within the cells (macrophages). This organism mostly affects lungs in immunocompetent individuals and disseminated forms are seen in immunocompromised cases. 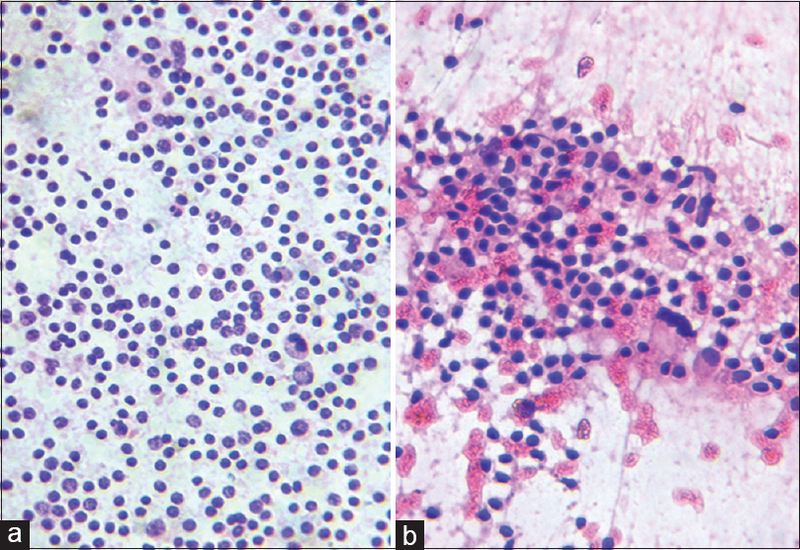 Here, we describe a case of disseminated histoplasmosis in an immunocompetent, 35-year-old female with lymphadenopathy diagnosed by fine-needle aspiration cytology and cell block. The preoperative diagnosis of metastatic intestinal gastrointestinal stromal tumors (GIST) on cytology can be quite difficult at times. 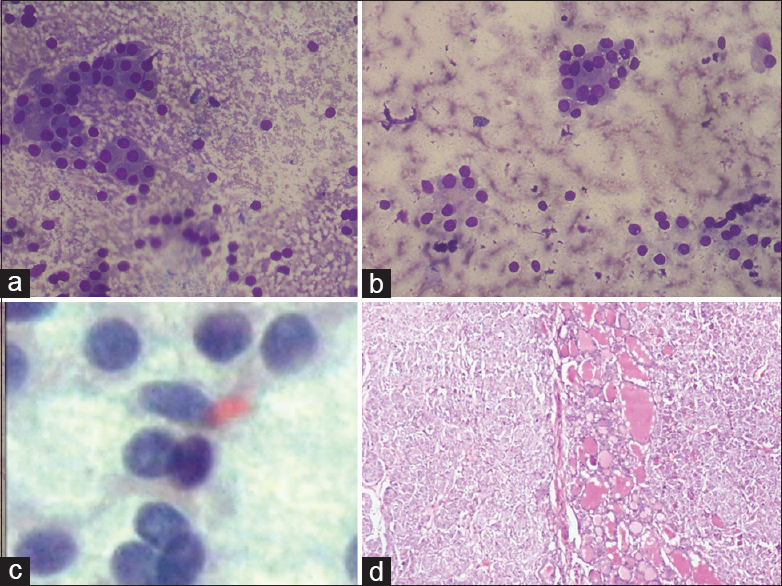 The present case characterizes the cytomorphological and immunocytochemical features of GIST, emphasizing the utility of fine-needle aspiration cytology (FNAC) in the evaluation of spindle cell tumors of gastrointestinal tract. An accurate and early diagnosis of GIST affects the treatment, primarily allowing the use of tyrosine kinase inhibitors in unresectable or metastatic cases. 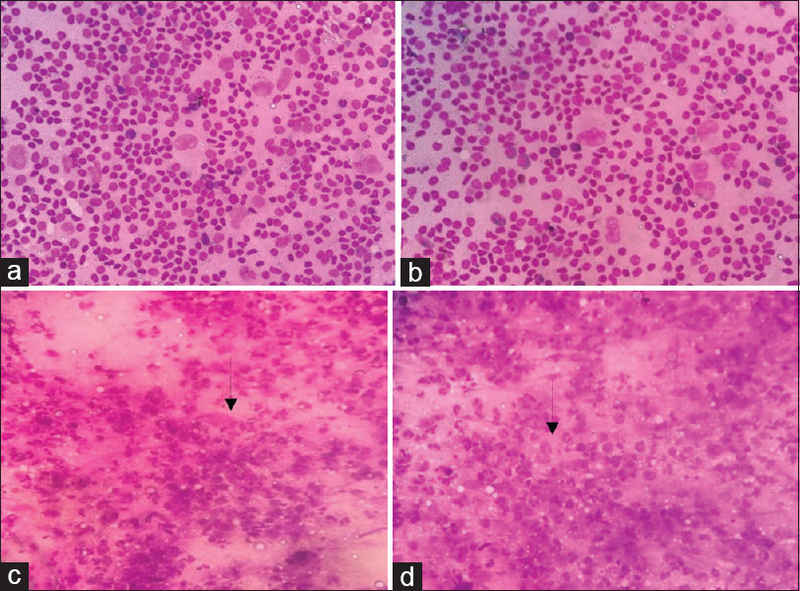 Presence of highly cellular fragments of spindle-to-oval cells with variable degree of pleomorphism, atypia, and necrosis supplemented by immunocytochemistry can render a cytological diagnosis of GIST in dilemmatic clinical situations. 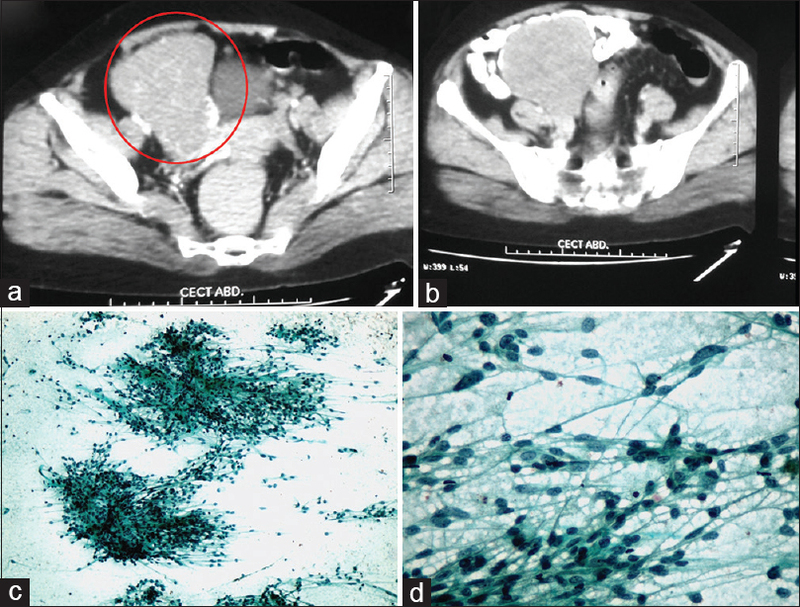 Our case highlights the diagnostic role of FNAC in the evaluation of a pelvic mass, which was clinicoradiologically misdiagnosed as ovarian carcinoma. Tuberculous mastititis is a rare clinical entity and usually affects women from the Indian subcontinent. It often mimics breast carcinoma and pyogenic breast abscess. Fine needle aspiration cytology (FNAC) is a very essential diagnostic tool when other routine laboratory investigations are not helpful in reaching to the conclusion. Tuberculosis (TB) of the breast is an uncommon presentation of TB even in countries where the incidence of pulmonary and extrapulmonary TB is high. Radiological imaging is not diagnostic. Anaplastic large cell lymphoma (ALCL) is a T-cell lymphoma, accounting for <5% of non-Hodgkin's lymphoma. Cutaneous involvement can be primary or secondary arising in systemic ALCL. The diagnostic feature in both is the presence of pleomorphic, CD30 positive hallmark cells. We present a case of ALCL in a 19-year-old male presenting as an ulcerated scalp swelling. Clinical impression was actinomycosis or scrofuloderma. Cytology smears showed large dispersed pleomorphic cells with hyperlobated nuclei and multinucleated giant cells. The differentials considered were ALCL, rhabdomyosarcoma, and poorly differentiated carcinoma. Immunocytochemistry (ICC) showed positivity for leukocyte common antigen (LCA) and CD30 while negativity for desmin, favoring ALCL. Computed tomography (CT) showed a lytic paravertebral lesion. Subsequently, both paraspinal and scalp lesions were biopsied and immunochemistry confirmed the diagnosis of ALCL. Thus, cutaneous involvement in ALCL can resemble inflammatory and other neoplastic lesions clinically and cytologically. Hence, a high index of suspicion and ICC can aid in the correct diagnosis on fine needle aspiration cytology (FNAC). Ceruminous adenoma (CA) is a rare, benign tumor of the ceruminous gland found in the cartilaginous part of the external auditory canal (EAC). The tumor is diagnosed on histopathology and shows a characteristic dual population of luminal epithelial cells and basal myoepithelial cells. However, CA can be diagnosed on fine-needle aspiration cytology (FNAC) prior to surgery and the cytopathologist should be well aware of its cytological findings to avoid any misdiagnosis. The tumor shows an excellent prognosis with possible recurrence and malignant transformation. 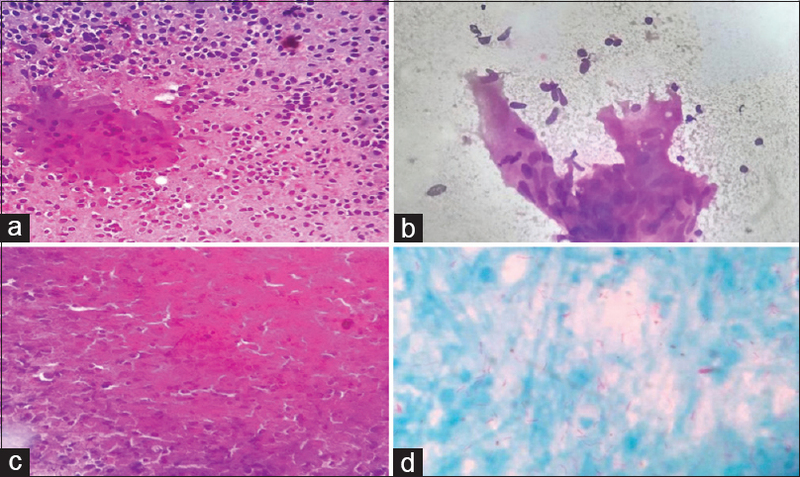 The present case emphasizes the cytological features of CA, which have been scantily described in the literature and highlights the role of cytopathologists in preoperative diagnosis. Primary sarcomas of the urinary bladder or prostate are extremely rare entities. The rarity and lack of awareness makes it difficult for the cytologists to detect the spindle cell lesions in urine for malignant cytology. The literature available for the detection of urinary tract sarcomas is little. Here, we report the urine cytology findings of two interesting cases of urinary bladder and prostatic leiomyosarcoma. 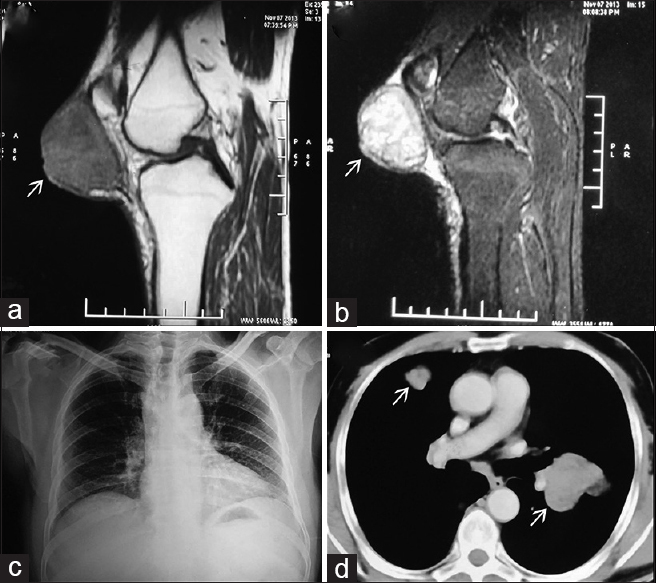 Tenosynovial giant cell tumors (TGCTs) arise from the synovium of joint, bursa, and tendon sheath, and are classified into localized and diffuse types. Diffused type often affects the large joint, and has more recurrence, metastasis, and malignant transformation potential compared to the localized type. Malignant diffused TGCT (D-TGCT) usually occurs as a large tumor (>5 cm), in older patients, and its histopathologic features include necrosis, cellular anaplasia, prominent nucleoli, high nuclear cytoplasmic ratio, brisk mitosis, discohesion of tumor cells, paucity of giant cells, and a diffuse growth pattern. At least five of these criteria are required for the histopathologic diagnosis of malignant TGCT because the benign TGCT also shares many of these morphological features. 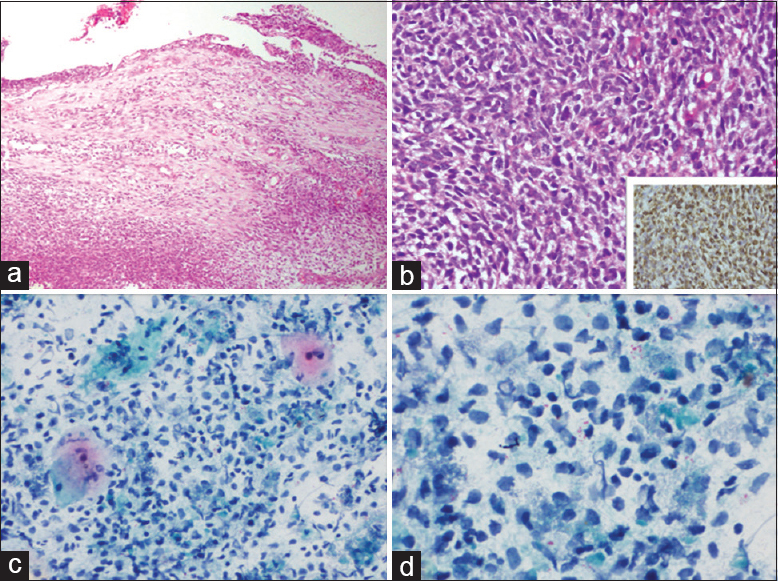 We describe the cytomorphologic features of a malignant D-TGCT from an unusual case of pulmonary metastasis in an adult patient. 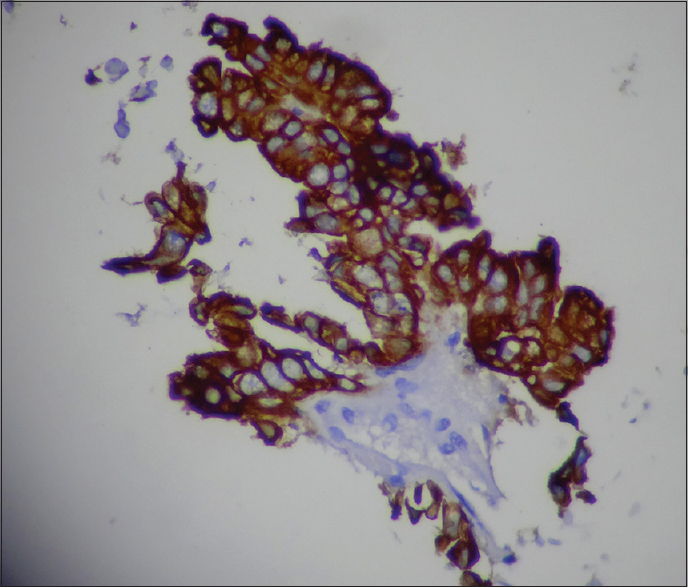 Fine needle aspiration cytologic features of malignant D-TGCT have not been described earlier in the English literature.